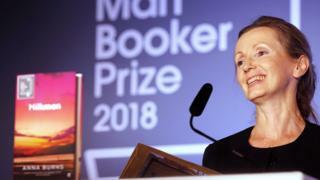 The Booker Prize will be funded by venture capitalist Sir Michael Moritz for the next five years after the Man Group, the previous sponsor, withdrew. The prestigious literary award will be paid for by Crankstart, the charity run by Sir Michael and wife Harriet Heyman. Welsh-born Sir Michael, who is based in San Francisco, is worth $3.4bn (£2.5bn), according to Forbes magazine. But the prize will not bear his name – it will be known as The Booker Prize after 18 years as the Man Booker Prize. Last year’s £50,000 prize was won by Belfast writer Anna Burns for Milkman. Sir Michael will also support The International Booker Prize. He began his career as a journalist for Time magazine and wrote the first biography of Steve Jobs and Apple in 1984. He went on to join Silicon Valley venture capital firm Sequoia Capital, investing in companies including Google, LinkedIn and PayPal. Harriet Heyman is a former writer for Life and The New York Times, and published a novel in 1989. Mr Moritz said: “Neither of us can imagine a day where we don’t spend time reading a book. The Booker Prizes are ways of spreading the word about the insights, discoveries, pleasures and joy that spring from great fiction. The couple founded Crankstart in 2000 to support and organise scholarship funds for university students from low-income families. The corporate sponsorship market is notoriously difficult for fundraisers working in the arts sector. Brands aren’t exactly queuing up to pour cash into exhibitions, fancy extensions, and annual prizes. Those that do often don’t hang around for long, and the more loyal can sometimes lead to negative publicity (such as BP) or strained relations. With this in mind, the Booker Prize will be very pleased to have found a donor willing to make a major philanthropic gift without demanding his name be attached to the prize, nor – one imagines – instructing his marketing team to milk the relationship for all that it is worth. Arts organisations across the country will be looking on enviously, and, I suspect, forming a queue to invite Sir Michael to lunch.